PCT 2018 Day 39, May 31, Thursday. 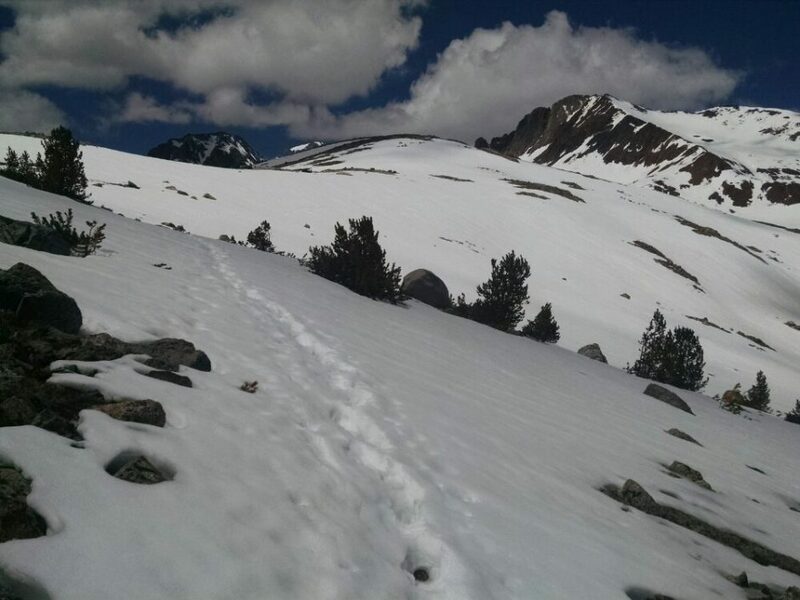 End mile 862.4, campsite 3.2 miles from Selden Pass Miles walked: 27.6 Frogger and Lake kindly let me follow them up, as they are better at finding glimpses of the trail between patches of snow. 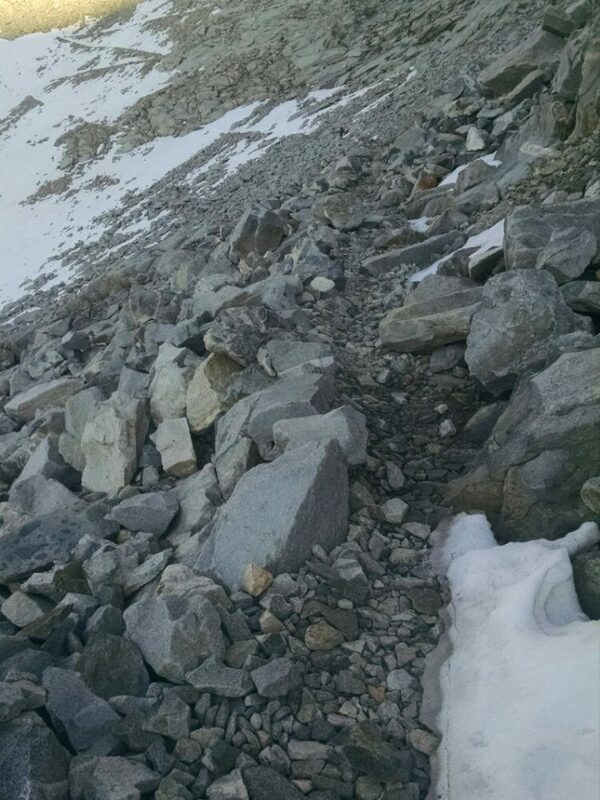 The climb up is too hard, no sketchy scrambles on ice or rock. 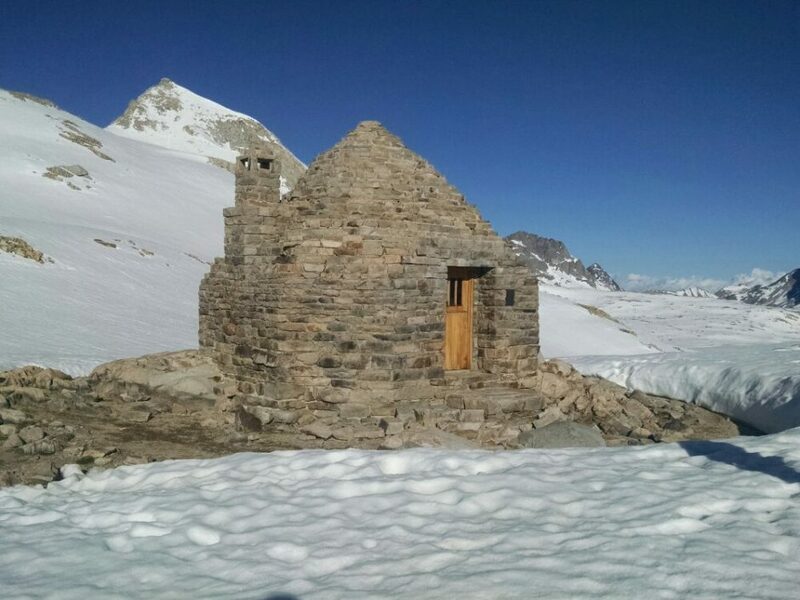 Muir Cabin at the pass is dedicated to the memory of John Muir, built of local rock. The charming chimney is bricked up. 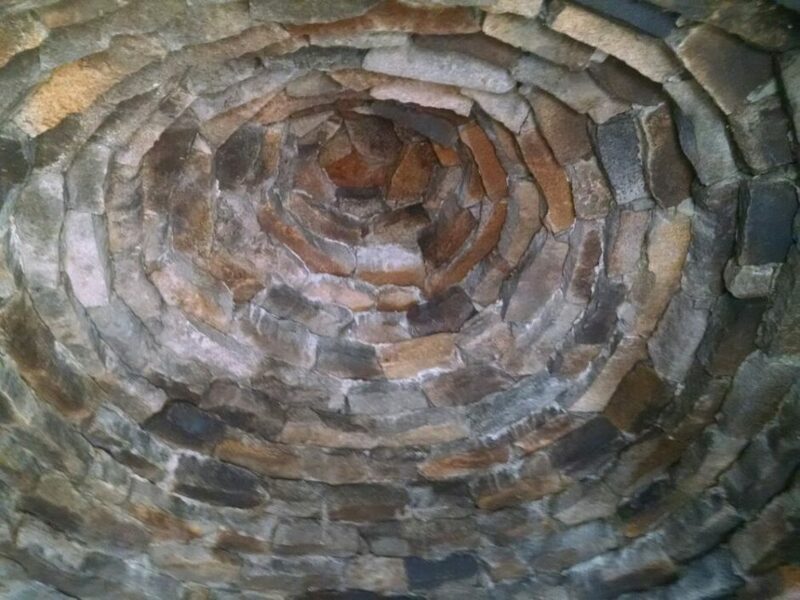 See the ceiling constructed of stone. 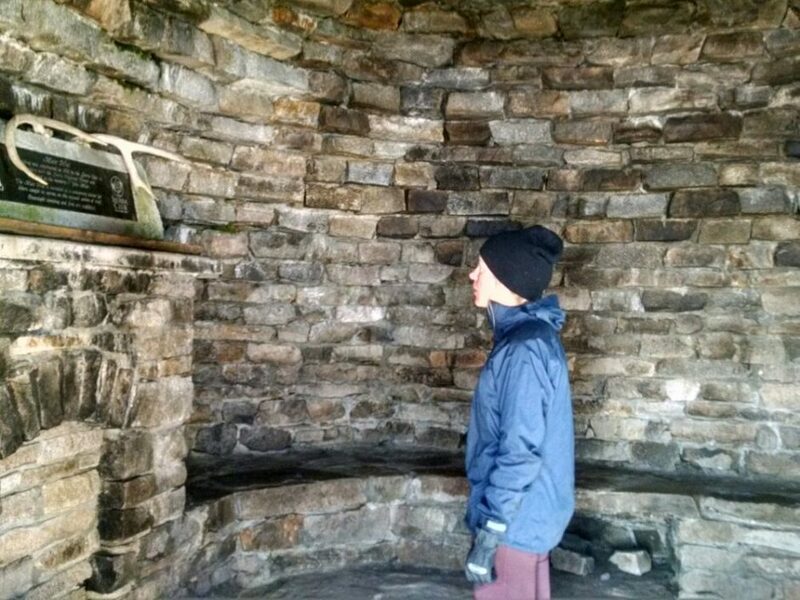 The cabin is surprisingly warm naturally, with one small window. About a mile of post-holing. 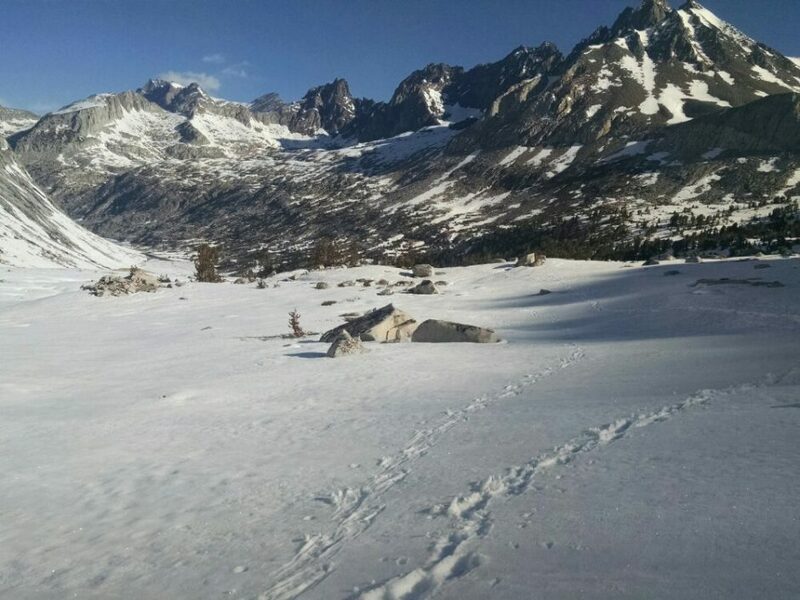 I saw Hershey and Nightingale just after the last of tho snow, planning to take an easy day since it was too far to the next pass. (I think to myself, “Challenge accepted!”) This lake with ice has a pleasing pattern. PCT 2018 Day 38, May 30, Wednesday. 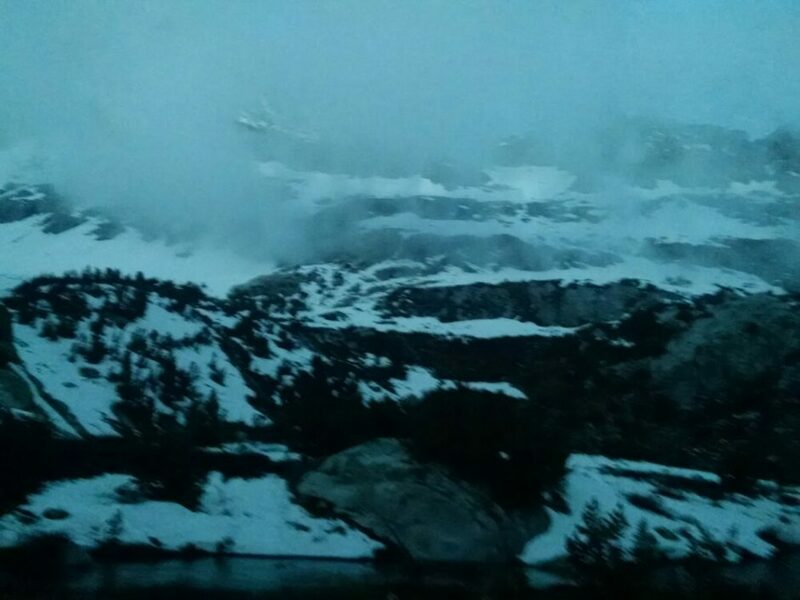 Starting extra early at 5AM, I climb up to Mather Pass by 7:30. 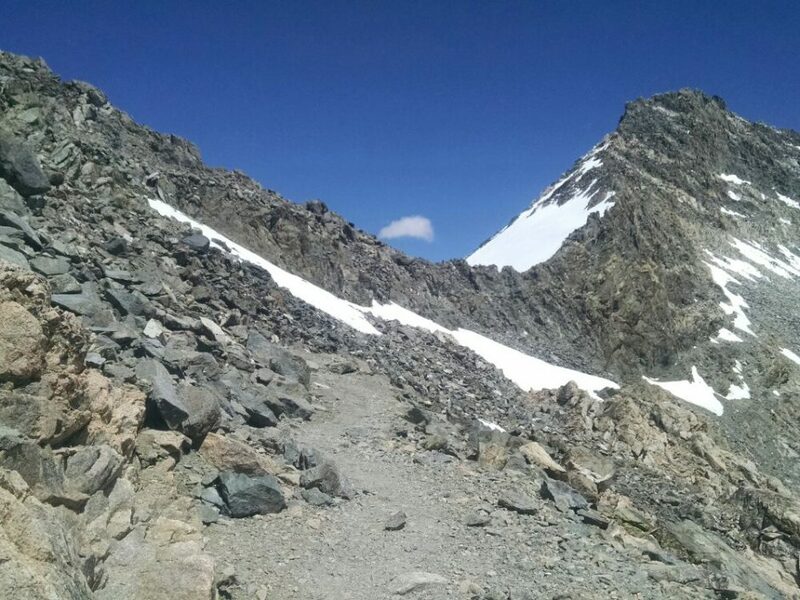 Following footprints was useful, but the last set of switchbacks were ignored, in favor of rock scrambling, perhaps a little too exciting at a steep 12k elevation. Summiting at nearly the same time are Nightingale and Hershey, and Lake and Frogger. I descend right away to get past snow before it is warm enough for post-holing. The path down is on a steep slope, treacherous. Several miles were necessary to get below from the snow, and post-holing began as early as 9AM, so starting early did not help much. We just had to power through. Then we descend on well-engineered switchbacks deep into a pleasant canyon, and follow along a river for much of the afternoon. I meet Easy, who I had not seen since before Kennedy Meadows. 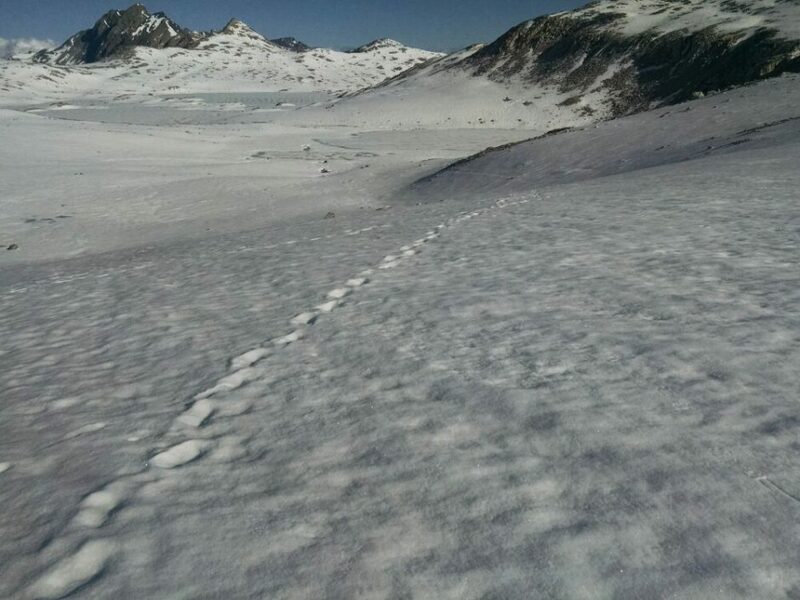 He heads off-trail to Bishop Pass to get resupply. 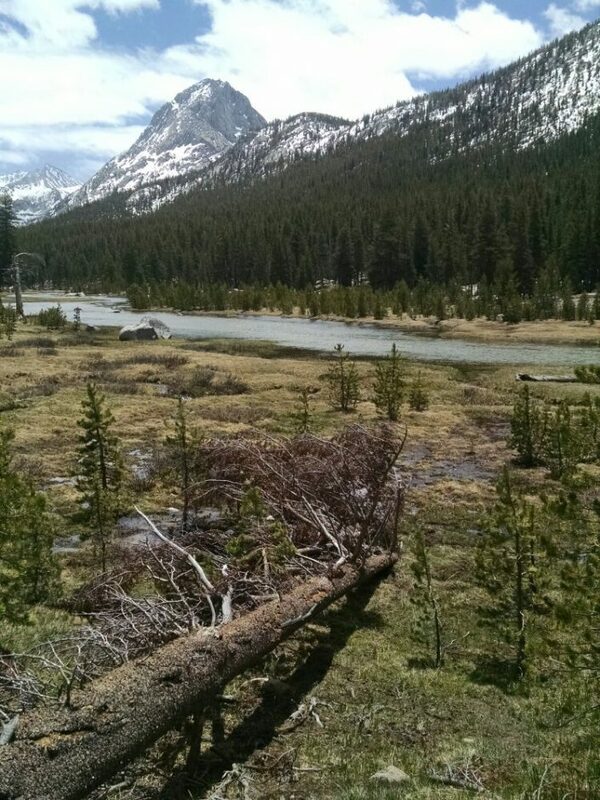 My campsite is by a river at 10k elevation, just at the 50 percent snow line, to be close to Muir Pass for tomorrow morning. Several other tents are nearby, as others plan an early morning summit. PCT 2018 Day 37, May 29, Tuesday. Because I quit hiking early yesterday, I was eight or so miles from the next pass, so I did not reach the summit until noon. Going up in soft snow was not too bad, but coming down was tough. Much more snow remained on the far side of the pass compared to Glen Pass, and post-holing was frequent. Several miles passed before snow thinned out to small patches on the trail. 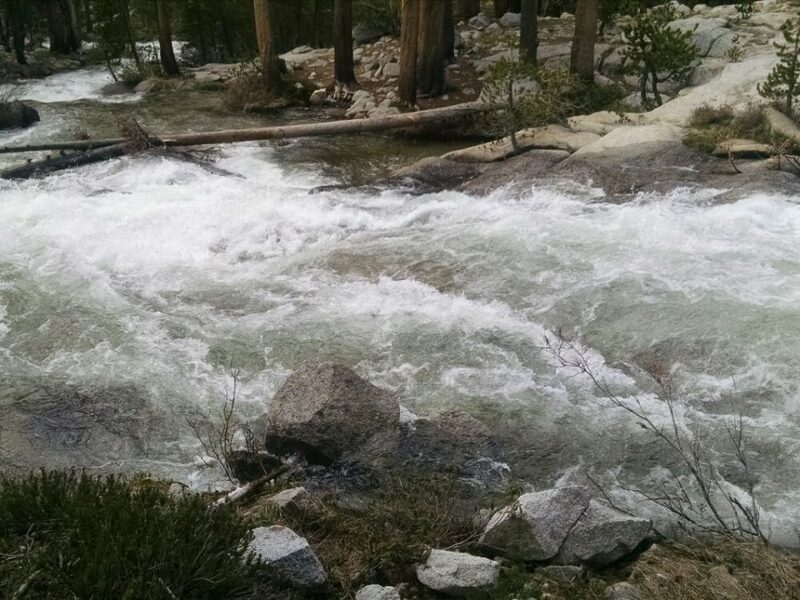 Many creek and stream crossings were necessary today, often a torrent from snow melt, often a challenge to ford. I camp closer to the next pass, and will start earlier tomorrow, in the hope of getting firmer snow. I saw no other person all day! PCT 2018 Day 36, May 28, Monday. Groundhog arranged for us to get a ride back to the trailhead, but the earliest we could get was 10AM. 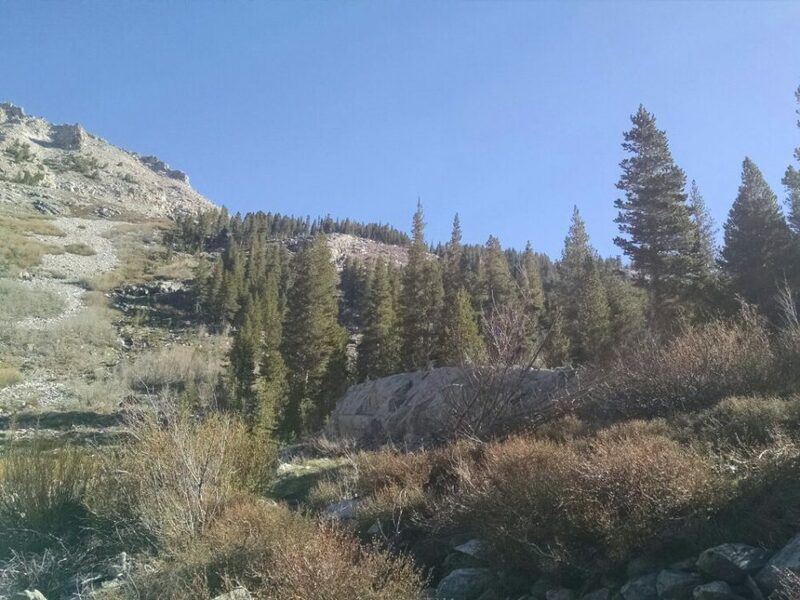 I went out to Onion Valley Road and caught a ride up, to start the trail at 8AM. 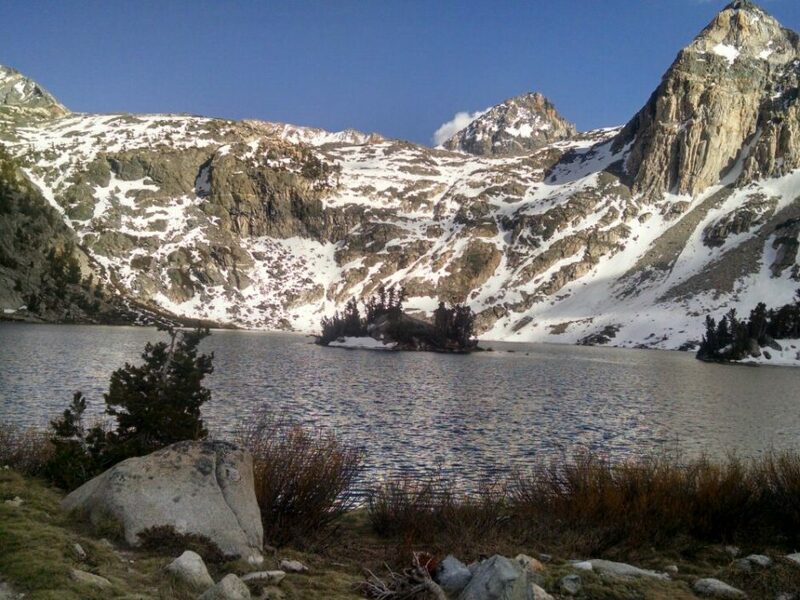 On the hike back up to Kearsarge Pass I met Karlie and Charlie, tent neighbors at Kennedy Meadows Grumpy Bear, and gave them info on Independence. Back to the PCT and then close to the approach to Glen Pass, I had to decide whether to climb tho pass later in the day, or wait until tomorrow. 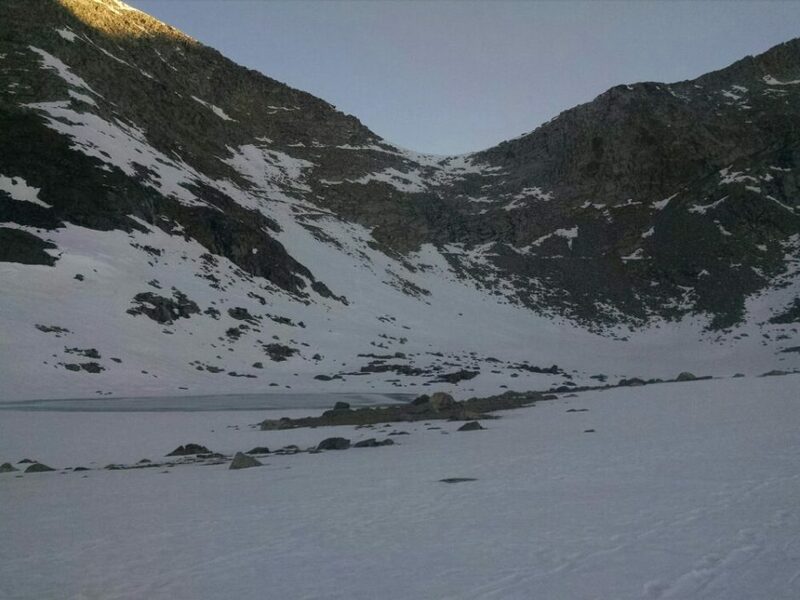 A lot of hikers are trying to climb passes very early in the morning for firm snow and to avoid post-holing on the way down. 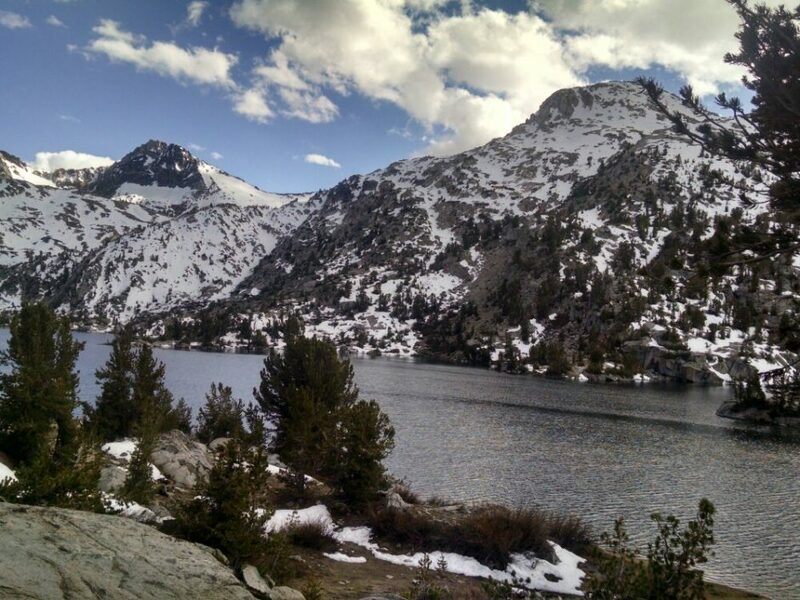 Looking at the pass, little snow remained on the trail-south side, so I decided to climb. Over the pass, more snow but mostly firm, not breaking through the crust. 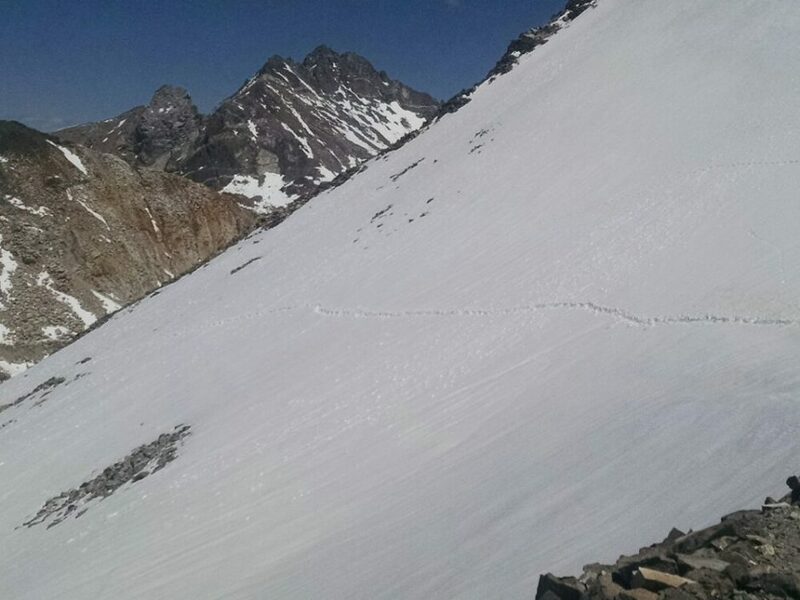 Following footprints, previous hikers climbed straight down the snow instead of following the switchbacks of the trail. This was tricky to follow, requiring care not to fall. Further down, post-holing happened more frequently, but soon I was past the snow. The trail goes the rest of the day along a series of lakes, with many creek crossings. 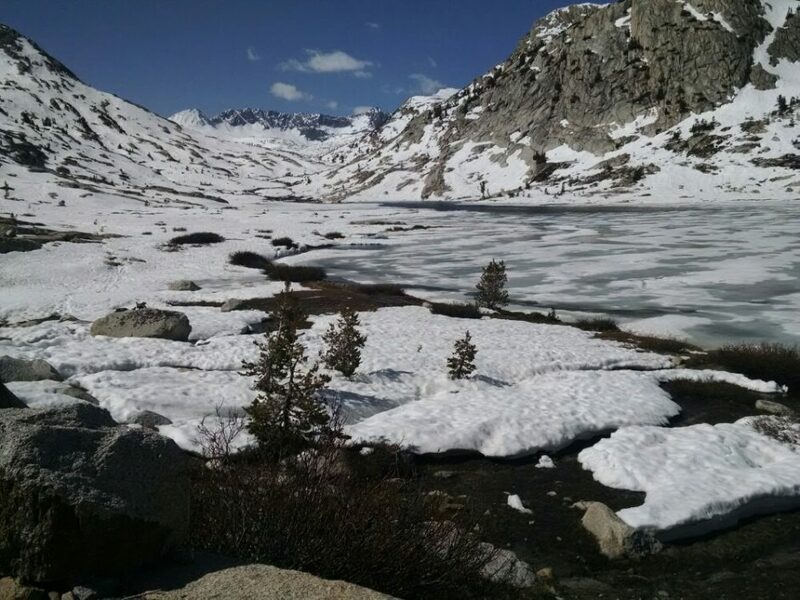 I try to get close to Pinchot Pass for the next day, but run out of energy and must camp several miles short.